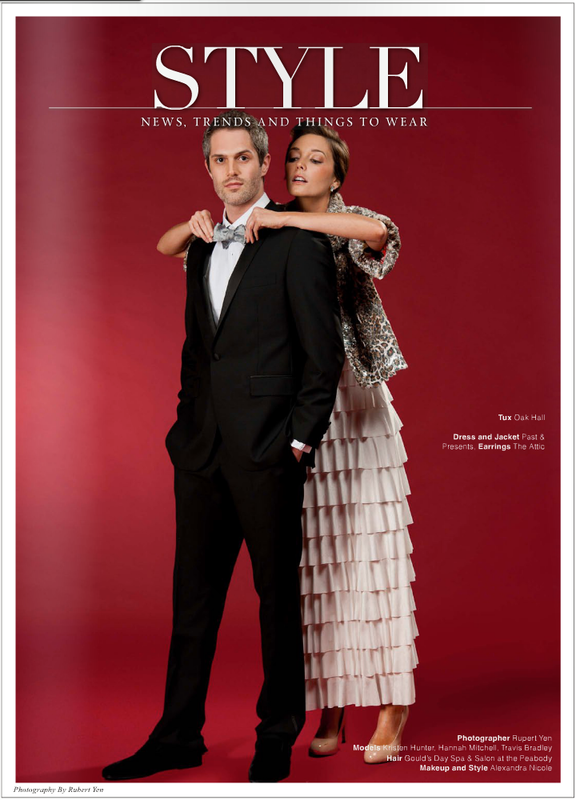 I am in love with our photo shoot this month in Click Magazine. When I saw Hallie’s (Click’s Publisher) idea board I was elated! Mixing my favorite fashion eras with a modern party twist had my creative juices spilling over with excitement! I arrived on the scene and Hallie, Maggie, and I began setting up the “style closet” area. I love pulling out all of the beautiful garments, jewels, shoes, and other accessories from all Memphis’ and Desoto County’s fabulous boutiques. My mind instantly puts together looks and pairs the appropriate accessories for this festive holiday shoot. Of course the Click team and our models (Kristin, Hannah, and Travis) are top notch professionals, but that doesn’t mean we can’t have fun. After Rupert sets up his camera’s he takes a minute to capture the fun that is taking place behind the scenes! After our team and the models get acquainted, it’s time to get serious. Makeup, hair, and photography begins. Hope you all love the outcome of the shoot as much as I do. Subscribe and stay tuned each month for the latest fashion shoots and updates. (Models: Travis and Kristen) Loving Travis’ exertion of power in this shot. This shot reminded us of the loving power couple getting ready for the biggest holiday social event of the season. Girly, frilly dresses are out this holiday season, it is all about the city, chic woman. Try some pumps (maybe even glittery ones) with hot skinny jeans and a flashy top as the center piece of the outfit. Or replace the statement top and skinny jeans with a sleek solid dress or tunic and chunky accent jewelry. Top your holiday look off with a sleek, more masculine inspired hair style and some deep red lips keeping your power look in place. With this look you can bring in 2014 more comfortable and better yet, with a BANG! This is the look I will be rocking for New Years! You can NEVER go wrong with a little black, shimmery dress or solid flowy chiffon tunic this New Years. FASHION UPDATE: Leopard print has once again, made a come back! Not sure which accessory to choose? Gatsby inspired accessories such as a beaded clutch and layered pearls with a few metal mixed necklaces will do the trick! I especially love this photo because it reminds me of last New Year’s (2013) when Ben and I met. Not only is this shot beautiful because of the fashion but our fabulous photographer, Rupert, and lovely models, Travis and Kristen, did an excellent job of capturing the fairytale chemistry that often happens during the countdown, just before screaming, HAPPY NEW YEAR’S! This look reminds me of fashion’s feminist movement during the 20’s and 30’s when women walked on the edges of what a “lady” portrays and sported a more masculine, powerful look. What’s best, is that the strength of the outfit doesn’t compromise the beautiful features and elegance of the modern lady. This look is so 60 and 70’s Ritz! The pant romper (this one is from our shop), the fabulous fur coat, and the golden linked, classy necklace screams Femme Fatale! She has all eyes on her when walking in to the party. Go big, or go home! Is this how the daring, classy ladies of the 20’s – 70’s made their exit on New Year’s Eve? I know this lady has emulated this picture a New Year’s or two laughing and reminiscing with my girlfriends about the fabulous night we just experienced. Once again our fabulous models, Hannah and Kristen, and photographer, Rupert, were able to evoke the happy feelings of New Year’s night as the parties come to an end and our resolutions have been solidified! Fashion styling is my passion and an art that I am lucky to have as a job! 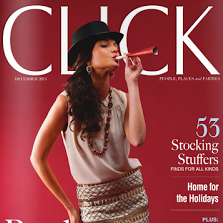 I love our team at Click Magazine and all of the wonderful boutiques that we work with! Special <3 and shout out to the team: Publisher- Hallie, Fashion Executive- Maggie, Photographer- Rupert, and our models for this month- Travis, Hannah, and Kristen. Had a blast and can’t wait for what’s in store for next month! Thank you so much! I'll be posting the Click shoots every month as a mini style update for the season!